« A Christian Pastor Says the Topic of Abortion Should Never Be Addressed at Worship Services – Is She Right? Those who support abortion rights have been successful in forming the public to understand the issue as a “private personal matter” between a woman and her health care provider. A woman deliberating about her options has an inviolable right of privacy. The sensitive and caring response to her unplanned pregnancy is to offer support – but not to interfere in any way. We are told to respect the wisdom of women to make the right choice. But like much of the propaganda and misinformation from those that promote abortion, it does not reflect the reality of most abortion decisions. Many abortions feature another person who served as a direct accomplice in the child’s death; the father, a friend, family member or professional who did not encourage the mother to give life to her baby; promoted the abortion decision as the best option; helped pay for the procedure or drove the mother to the abortion center. In other scenarios a father, grandparent, other family or friend may have been traumatized by their inability to prevent the child’s death. Abortion is rarely a private personal decision. Given the impact of abortion on individuals, relationships and family life, it is better understood as a complicated experience of physical and emotional loss that intimately wounds the individual. But over time the symptoms after abortion can also impact a mother/father’s relationships, marriage and family life. 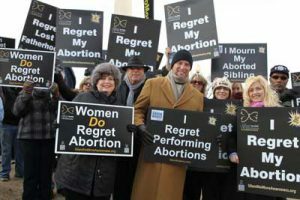 On January 18th 2019 the Silent No More Awareness Campaign will once again gather at the steps of the Supreme Court in Washington, D.C. at the March for Life and also later in the month at the West Coast Walk for Life in San Francisco on January 26. The Participants will hold their powerful signs witnessing to the world the truth about their abortion loss and regret, and through their testimonies, the destructive power of the Shockwaves of Abortion. Most importantly, you will be blessed and deeply moved as you witness the incarnation of the mercy and healing power of God. I have been in pro-life advocacy and abortion recovery ministry for over 20 years. Being part of the Silent No More gathering in D.C. each year is one of the most powerful spiritual and emotional experiences in my many years of pro-life outreach. I encourage you to join us at this year’s Silent No More Campaign events. We look forward to seeing you! This entry was posted on Monday, January 14th, 2019 at 9:10 pm	and is filed under Uncategorized. You can follow any responses to this entry through the RSS 2.0 feed. You can leave a response, or trackback from your own site.